Animated face changer is a cool, free application to have fun. Add funny elements to pictures. Using animated objects you can create amazing pictures! 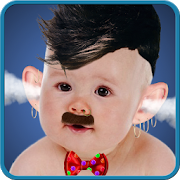 Create a funny face using animated noses, ears of animals, funny mouths. Add wigs in different colors, bulging eyes or apply cool animated hats. The final result depends entirely on your imagination. – You can add your own text in different colors. You can choose from many interesting fonts. – The function of adding sounds – Add animated lips to the photo and record your own sound or select from the funny sounds, prepared by us. With this option, the person in the photo will be able to speak! In case of any problems with the effect of animated face changer, instead of giving us the negative opinion, please send us an e-mail and review briefly the problem. It will help us to solve it in the next updates of app. Animated face changer is free but contains ads inside app. Revenue from advertising will help us to create new attractive wallpapers and applications. All permissions are required only for advertising and are supported by trusted vendors.